I’m aware that Being John Malkovich is a Criterion title that’s been available for a couple of years now and that most people looking in at this probably own a copy of it already, but I still felt compelled to give it a spin. After all, Roger Ebert said it was the best film of 1999, and with praise that high, you can’t really ignore the film and must seek out. And for those that haven’t yet, you’re in for a special treat. Spike Jonze had some recent success with Her, and that film owes more to Being John Malkovich than even it realizes. Charlie Kaufman’s strange yet bold story of an out-of-work puppeteer turned office temp worker who finds a door that leads into the mind of John Malkovich was a tough sell back in the 90’s, even at a time when the indie film scene was burgeoning with new ideas and fresh approaches. Truth be told though, that scene was on its way out the door by the time that this film was released. Oddly enough, it was financed and released by a major studio, Universal Pictures, which I find the most interesting aspect of all. Being John Malkovich is one of those films that’s almost impossible to explain to someone who hasn’t seen it. Most would call it a romantic comedy with twist, which is essentially what it is. It’s more complicated than that, and raises a few issues in your own mind about identity, love and loss, as well as making you think a lot more than you would in a traditional romantic comedy about what’s going on in the film. The film also plays around with a lot conventions and turns them on their head. The possibility of a romance between two people is thwarted by the fact that one of their significant others also has eyes for someone. In this case, it happens to be the very same co-worker, but through the eyes of John Malkovich. Only in a film like this would something like that be possible. The cast is pretty interesting as well, including John Cusack, Cameron Diaz, Catherine Keener, and of course, John Malkovich himself. They all give terrific performances, but I think that it’s Cusack who really steals the show in this one. His performance as a guy who slowly loses his identity to the point where he is nothing at all is a strong metaphor for people in everyday life. It’s just a terrific piece of filmmaking, and one that just seems to get fresher and fresher upon further viewings. Criterion’s Blu-ray release of Being John Malkovich sports an excellent, but a bit imperfect, transfer. Sourced from a newly restored digital transfer (supervised by Spike Jonze himself), there’s an enormous amount of image detail and clarity; not just in the foreground, but in the background, as well. It’s also a very sharp transfer, but it dips slightly in spots. However, I think the original photography may be to blame for that, especially during the portal scenes. Colors are often muted, but recreated perfectly, with some lovely skin tones. Blacks are very deep and both contrast and brightness are at mostly perfect levels (again, the portal scenes and some other scene transitions dip a bit). I didn’t spot any burdensome digital manipulations at all either. The film’s soundtrack, which comes in an English 5.1 DTS-HD track, is very well-mixed. It uses the extra speaker space to its advantage, but not overtly. It’s quite subtle at times, actually. The portal sequences, however, are the most aggressive, and are quite robust. Dialogue is always clean and clear, and the soundtrack often has some nice ambience to it, depending on the environment from scene to scene. Overall, it’s a very pleasing transfer in both categories. There are also English subtitles for those who might need them. The disc’s supplemental section is quite extensive, with some great stuff to dig into. There’s a scene-specific audio commentary with filmmaker Michel Gondry; the All Noncombatants Please Clear the Set documentary by filmmaker Lance Bangs; an interview between John Hodgman and John Malkovich; a set of On-Set Photos containing an interview with Jonze; the 7½ Floor Orientation and “American Arts & Culture” Presents John Horatio Malkovich: “Dance of Despair and Disillusionment” short films as seen in the film; an Intimate Portrait of the Art of Puppeteering, another documentary by Bangs; a set of TV spots; the film’s original theatrical trailer; and finally, a 12-page booklet featuring a conversation between Jonze and pop-culture critic Perkus Tooth. 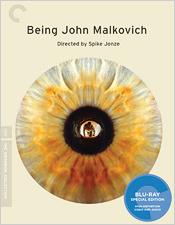 Overall, Criterion’s release of Being John Malkovich is another winner. It’s not a completely perfect package, but it’s pretty close. It’s a unique film with a unique vision in a package that most film fans should be very satisfied with.